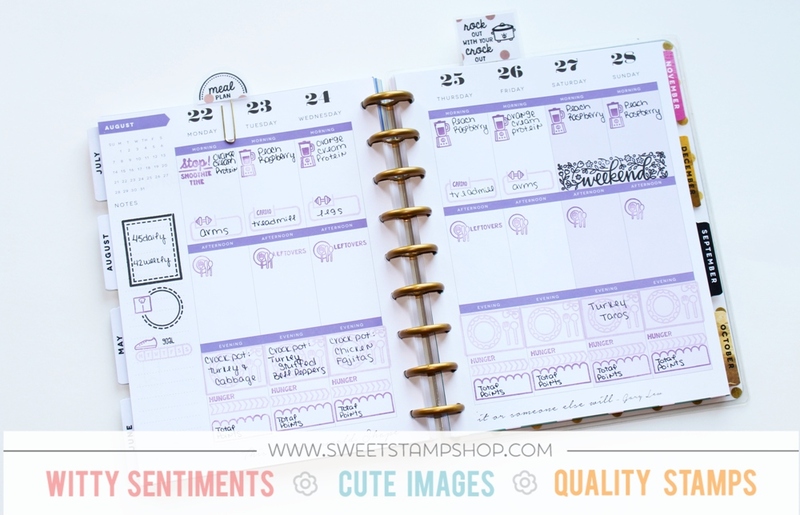 Sweet Stamp Shop: I'm on the Sweet Stamp Shop blog today sharing my Health & Fitness Planner! You can view the post below, or go check out the SSS Blog! I'm on a pretty large journey to getting healthy. I keep a separate planner for my healthy meal planning, tracking my weight watchers points, and exercises. I could use a phone app, but I really like having something tangible that I can flip through. Since this is something that is very important to me, I wanted to make sure it was fun and pretty. 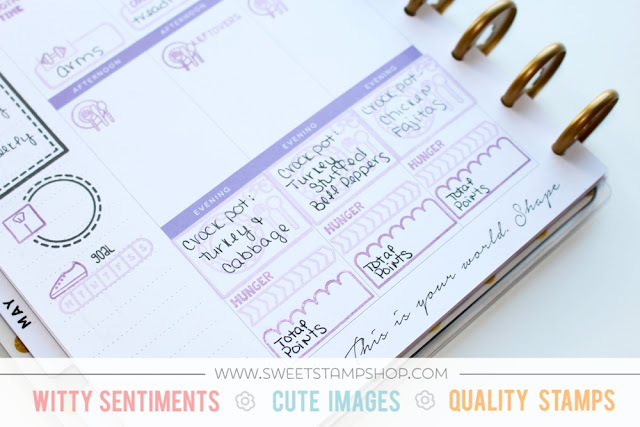 Today I'm going to show you what stamps I use in my health & fitness planner. In my sidebar I use stamps to notate what my allotted weight watchers points are for the week. With weight watchers, as you lose weight your allotted points go down. So I like to keep track of that at the start of the week so I know exactly how many points I can use. For this, I use the large box from the Basic Tabs set. If you're not on weight watchers and just interested in keeping a health/fitness planner, you could use this box for any reminder. I'm not a huge breakfast eater [I'm working on it...] so I usually have a protein smoothie. 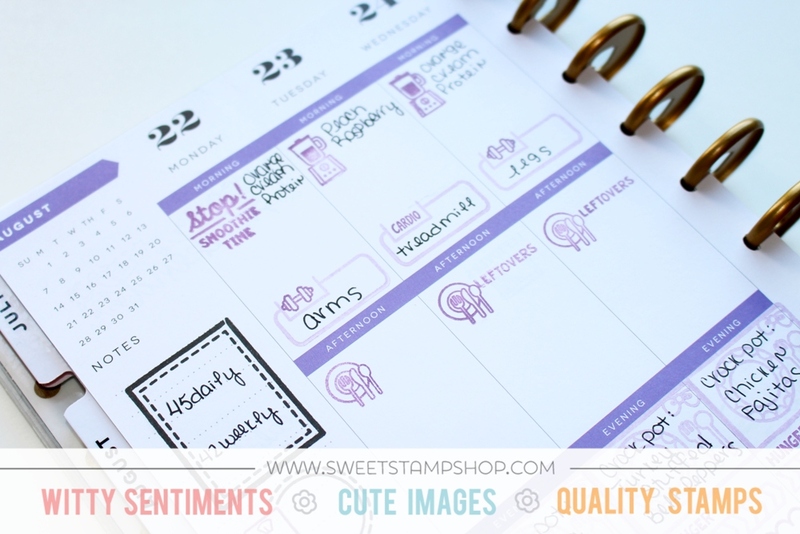 How CUTE are these blender stamps with the sentiment "STOP Smoothie Time"?! They are available in the new August Release set, Kitchen. Next in my sidebar I have the matching dashed circle from Basic Tabs. This is where I notate my weekly weigh-in loss [or gain...]. To show this, I use the scale icon from Plan Fitness. Also, from Plan Fitness I use the running shoe to represent my Fitbit tracking. Using the word "goal" from Like a Boss, and the weekly date tracker from Rupert Tracker. I will put an X on the days I met my step goals or I'll color it in. I work from home week days so I don't really plan my lunches. Usually I make a fruit & veggie snack plate, but I want to make sure I write down what I eat. So I use the plate & utensil icon from Plan to Eat in this box. I leave the rest of this box blank so I can fill in my lunch and any snacks I had. In the last box I use the super ADORABLE meal half box stamp from Half Box Decor for the dinners I've planned. Under that I used more tracking stamps to track my hunger level for the day. I find this has been incredibly helpful for me. I can look and see what I ate each day that either had me feeling satisfied or not. I can also cross reference this to see if I was hungry because I was hormonal or emotionally "hungry". Finally, I have a section where I write down the total points I ate that day. This week I used a stamp from the new set More Tabs. Each morning when I sit down to look at my planners with my coffee, I fill in this box pulling the info from my weight watchers app. I'm LOVING the new Whimsy Weekend set for Saturday and Sunday. I use the long weekend stamp in this spot because I don't work out on the weekends. Speaking of workouts, once again we're pulling from the Basic Tabs and Plan Fitness sets. I use an activity icon from Plan Fitness to represent my workout for that day. These are very general because I keep an actual detailed list of my workout on my phone since I'm not hauling my planner to the gym. I've been using this planner for health & fitness for a little over a month now. It has been amazing for motivation and documentation. 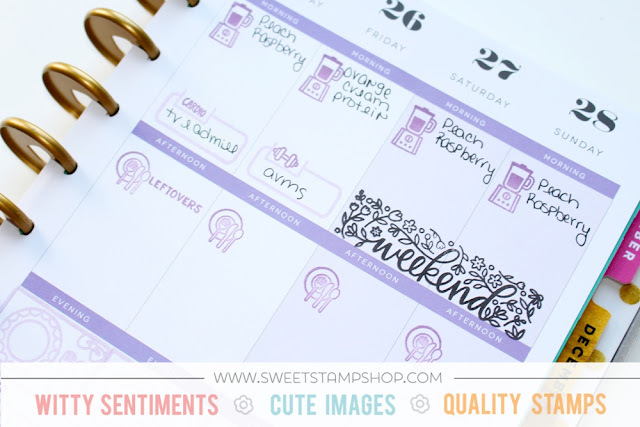 My Sweet Stamp Shop stamps help me personalize my layout to fit my needs each week! Do you keep a health & fitness planner or journal? 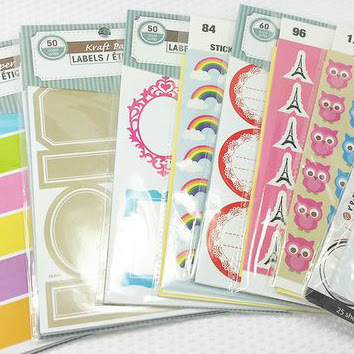 What are your favorite Sweet Stamp Shop sets to use in yours? 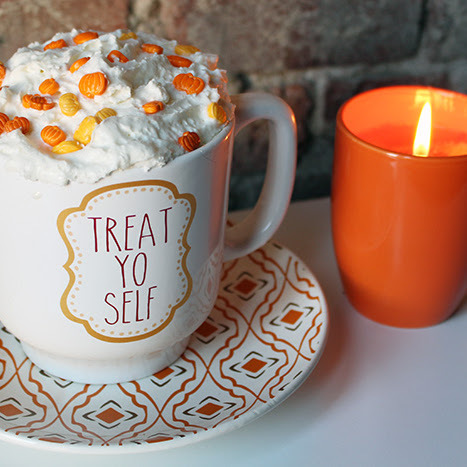 Oh do I have an awesome DIY for you today! 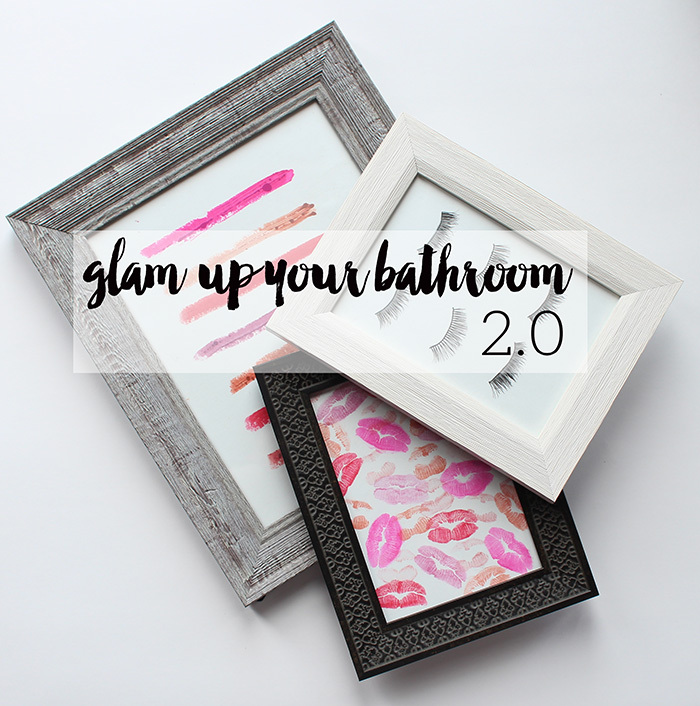 It's "Glam up your Bathroom 2.0"! In case you missed my original Glam up your Bathroom post be sure to check it out. 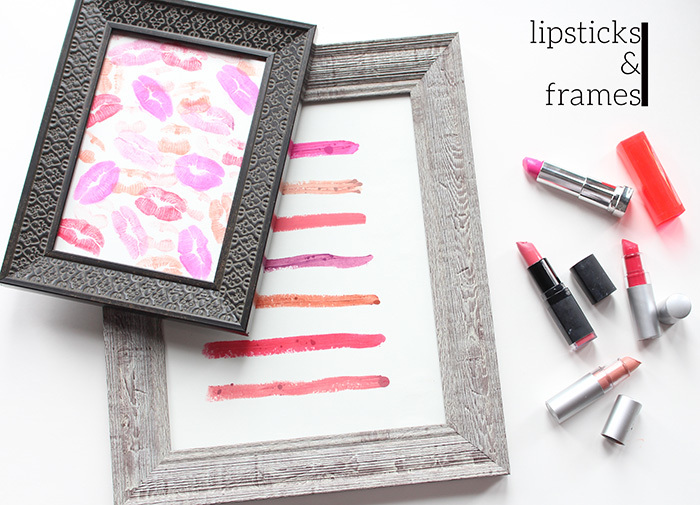 Today's DIY is even more simple and even more glam than the first. This DIY uses makeup! Yes that's right. This DIY will use supplies you likely already have in your bathroom! 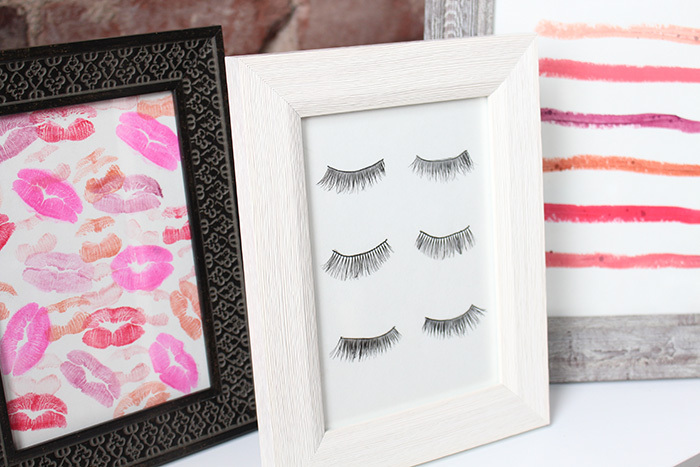 We're going to make this fabulous framed makeup art for your bathroom. I wanted something glamorous [obvi] and something that would make a big statement on a budget. Makeup in itself is art. So why not choose it as a medium for an art project? I took off to Walmart to purchase frames for my project. I had a very specific look in mind for my frames. I wanted something modern but not matchy matchy. While I was at Walmart, I grabbed up some toilet paper. 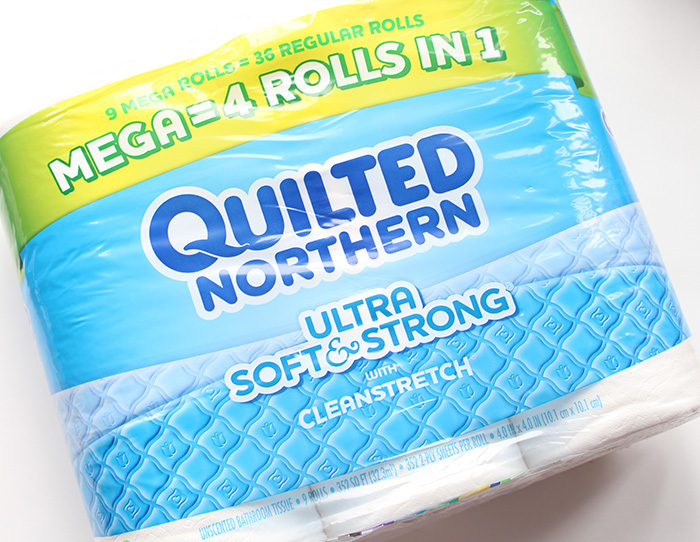 My eyes were immediately drawn to the Quilted Northern® Ultra Soft & Strong® with Cleanstretch (9 Mega Rolls). I can't think of a better way to stay stocked up on toilet paper without having hundreds of rolls stacked up. Space saver! 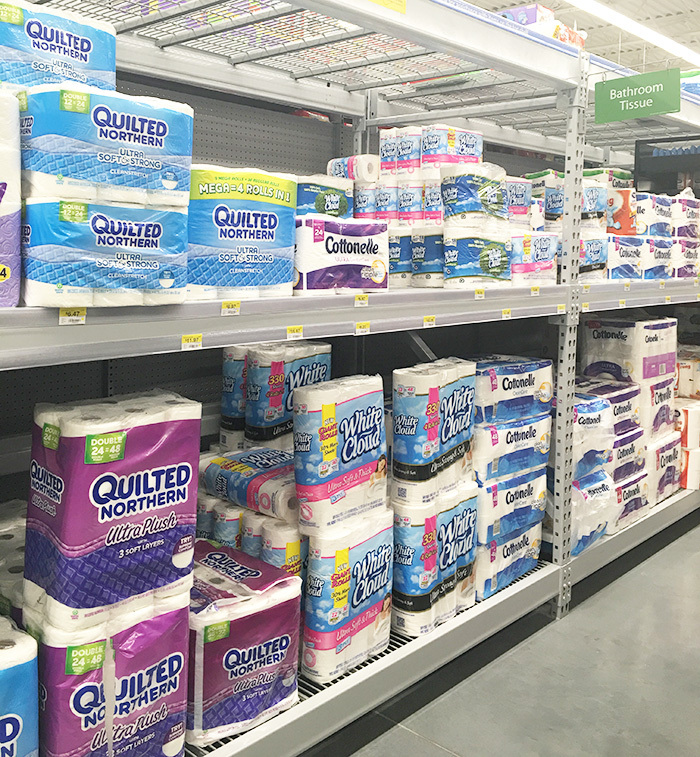 The Mega Rolls are 4x bigger than regular Quilted Northern® rolls. 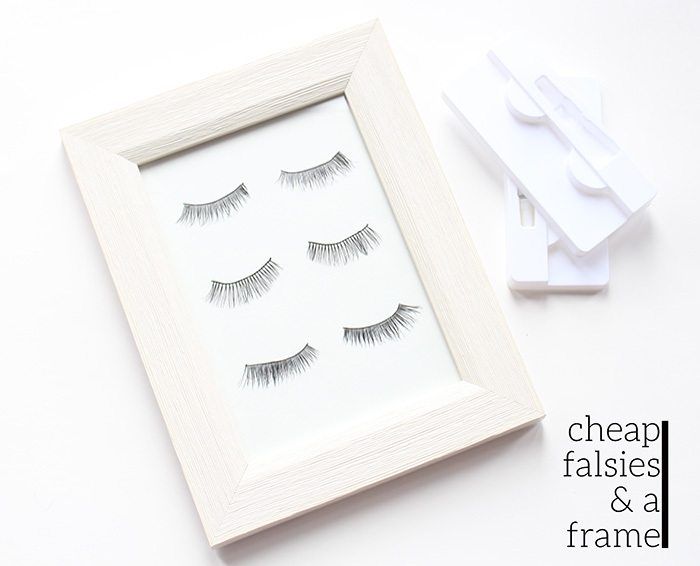 For the falsies frame I grabbed some super cheap falsies from Walmart and just lined them up on white card stock and framed them. I mean seriously, how easy is that?! Plus, look at how fresh and glam they look! I advise getting at least 2 different styles of falsies like I did. This creates a variance in texture. These were super FUN to make! Keeping with how simple these are, I bet you know what I did here. Yup, you guessed it! Slather on a few layers of lipstick and pucker up girl, cause we're kissing paper. I chose several different shades of lipstick and kissed my card stock. Slap that puppy in a frame and voila! The larger one I wanted to be a little less busy. I wanted a lot of the white showing much like the falsies frame. So I grabbed those same shades we put on our lips. I pressed the lipstick directly to the card stock and dragged it across in a line. You'll want to apply a good amount of pressure here. It creates texture. Put it in a frame and we're done! Display them however you'd like. You can hang them or stand them up. I opted to place them on my shelving that I store my extra Quilted Northern® Ultra Soft & Strong® with Cleanstretch rolls. Who knew you could make toilet paper organization so glamorous? I did! While you're out picking up your supplies for this Glam DIY, don't forget to pick up Quilted Northern® Ultra Soft & Strong® with Cleanstretch mega packs. Because there is NOTHING glamorous about running out of toilet paper! How do you store your stock pile of toilet paper? Out in the open or behind closed doors? Be sure to tag me on social media when you make your own Glam DIYs! I don't have any food pictures for you this week. I do have another Weight Watchers planner video for you! This is going to be a shorter post because I'm loving all the same stuff guys. Nothing new. I'm just keeping on keeping on with the Weight Watchers hustle! I AM seriously considering a secondary YouTube channel though. I know I touched on it last week, but I really really think I may go ahead with it. I'd like to share with you what I eat in a day and videos seem the way to go. So stay tuned for that. I've been filming like crazy lately so definitely go check out my YouTube channel and subscribe if you haven't already. I'll be going back to regularly scheduled blog posting in addition to WWW soon. I've just been having so much fun filming and editing for YouTube that I haven't written much lately. Don't worry, my readers are always on my mind! I have some amazing content coming your way soon! I want to thank you all for the wonderful feedback I've been receiving on my WW content. It's awesome to find that so many of you are also on WW! The GOOD news is, I know exactly why I didn't lose weight and I can recognize that it was my own fault. I just over indulged on very naughty food choices haha! Well I'm back at home this week and going strong with counting my points and making the RIGHT choices. My current favorite snack is any vegetable lightly dipped in the Bolthouse Farms Cilantro Avocado Yogurt dressing. 1Tbsp is only 1sp! A little goes a long way too because it has a very robust flavor. This dressing is available at Wal-Mart for $3.48 which isn't bad if you're considering how little you will use at a time measuring it out! I'm still loving the chicken sausages from Aldi. Last week I had Spinach Feta, this week I purchased Italian seasoned chicken sausage. They are $2.99 for 4 and 4sp for one and 7sp for two. Still loving cherries! I've found that in my town Wal-Mart Neighborhood Market has the best price and quality of cherries. I have also been enjoying seedless watermelons. Our Neighborhood Market had them 2 for $5 this week. Last night I made this dish. I'm not sure if the picture is overly appetizing, haha! It is to me though because I know how yummy it was! This was my first time making spaghetti squash and I think I might be addicted. I basically used THIS recipe I found on Pinterest but modified it a little. It's essentially sauteed mushrooms and shrimp over spaghetti squash. I didn't use lemons in mine like the recipe called for because I basically had the squash and shrimp and just searched for recipes on Pinterest. It was fantastic though. We really enjoyed it. The original recipe I linked calculated it at 9sp for a serving. Since I didn't use the wine and some of the other ingredients she did, mine came to 8sp a serving. I had 2 servings though because I worked all day and hadn't eaten except for some veggies and Cilantro Avocado dressing while I filmed a video for YouTube. Speaking of which... here's my Weight Watchers Planner video for this week! Let me know what else you guys would like to see from me on Wednesdays. I'm really REALLY contemplating creating a second YouTube channel completely devoted to WW. I'm thinking grocery haul ideas since I'm a huge Aldi shopper. I think that's what gets me about WW. So so so many people think they have to shop at Trader Joe's or Wholefoods exclusively. Well I don't have either of those where I live, we have a strict food budget, and 90% of my food comes from Aldi. I make it work and I'm succeeding just fine. I kind of want to develop a platform to share my budget friendly WW meal ideas and grocery hauls. Of course I could do this in my weekly Weight Watchers Wednesday posts too I suppose. I don't know if I'm consistent enough in my day to start doing a "what I ate" video every single day. Mainly because half the time I don't even remember to take pictures of my food! Now I'm rambling... Think it over and let me know what medium you prefer. 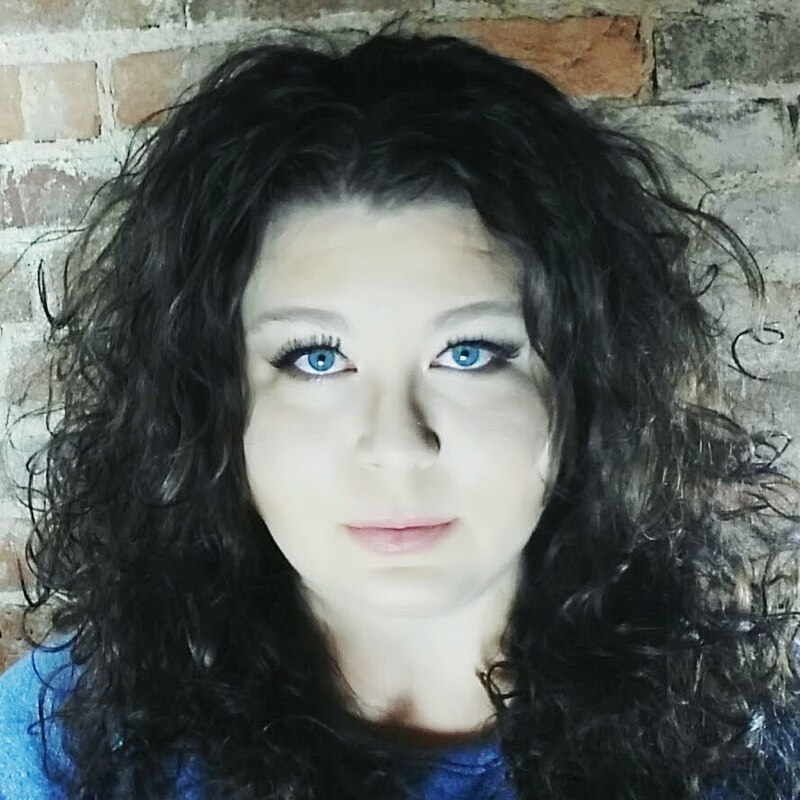 Would you like more detailed blog posts or YouTube videos? Thanks for stopping by this week's WW Wednesday!